Usually I have a creepy feeling looking at caterpillars but somehow this particular one had me transfixed. Spread-out lengthwise on the leaf surface, it looked so sweet and cute with those black eye-like structures, somewhat resembling the face of a mischievous child caught stealing fruits at someone’s backyard. I was enraptured as I gazed at its beautiful design and hairy form from head to toe and at the same time salute it for having picked the perfect Pink Chinese Loropetalum plant in our tropical garden to camouflage itself. Of course, it didn’t know that humans could detect it easily, huh! 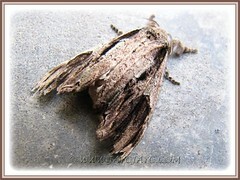 Anyway, it was fortunate to have been spotted by me and allowed to mature into an adult moth. I, on the other hand, felt blessed too to have learned so much in the process, hands-on especially. My extreme eagerness to know the identity of this interesting creepy crawly led me to a wonderful trip of new discoveries. 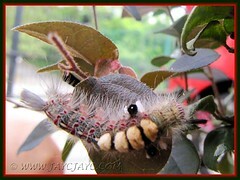 Spent many hours googling for answers and enjoyed awesome caterpillar/moth images never seen before by me. Even emailed a few sources for help too. Thanks to Gan Cheong Weei & Steven Chong of NSS-Butterfly Interest Group for identifying it as a Tussock Moth caterpillar. With this clue, I was able to finally identify it as the larvae of Rusty Tussock Moth (Orgyia antiqua) as pictured at UKmoths Vapourer page. But that wasn’t so as advised by the butterfly experts because the only way to correctly identify it was to wait for the adult to emerge (eclose) from its cocoon and photograph it as reference. Hence, I embarked on one of the most exiting adventure into the nature study of moths… transporting myself back in time as an excited child again. 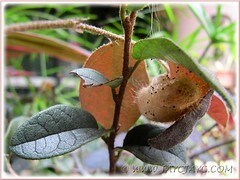 I first spotted this 3.5-4 cm long caterpillar on 31st January and was captivated. 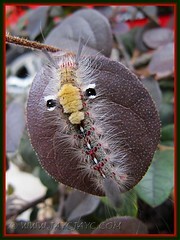 A very hairy caterpillar all over, with its head, legs and prolegs in crimson, blackish body with four brownish tussocks of hair on its back and a black eye-like structure sandwiched between a pair of white lateral tussocks on either side. I kept a close watch of it for days out of curiosity. On the 5th evening, it looked fuzzy, sort of curled and I thought it was going to die… I was somewhat ignorant of what to expect as I’ve never before observed one so closely. Still hot on the trail of finding its ID, I allowed myself to be coaxed by online suggestions into rearing the cocoon in a container, remembering how excited I was to create that temporary home… my very first attempt! After rummaging through my kitchen for a suitable glass bottle, tupperware, etc., I finally settled for a 1.3kg Captian Oats plastic container and placed the cocoon inside on February 8th to wait for the tussock moth pupa to become an adult. 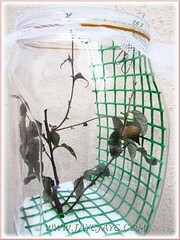 The winged moth would take between 7-14 days from completion date of cocoon to emerge, according to Mr. Gan CW who further advised me to keep the container indoors, not to mist nor feed it. 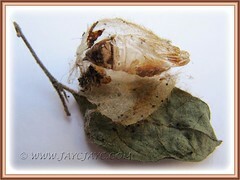 It does not eat during the pupal stage in the cocoon, and as an adult too. 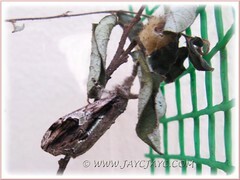 The pupa kept me eagerly waiting each day in anticipated excitement. Not for long though, because a peek into the container in the morning of February 12th, confirmed it had completely metamorphose into a lovely winged moth, probably emerged hours before my wake-up. Terribly happy with the whole successful episode, I decided to release the 3-day old moth on February 14th, the significant Valentine’s Day for lovers, so that it can go forth to find its mate and reproduce… it seems that’s its sole purpose! Strange that even though it was so tiny, I was more fearful of it than it was of me. My hand must have shaken terribly while trying to place the branch with it on our hydrangea bush, causing the moth to land on the nearby concrete floor instead. Anyway, I’m glad that it preferred the floor for its maiden flight which enabled me to capture numerous shots of it. And, by presenting a clearer shot of the adult moth at the Facebook Group – Butterflies of Singapore and Malaysia, Mr. Gan Cheong Weei was finally able to confirm its identity as a female Olene mendosa! A big thank you to Mr. Gan for all his help and guidance. All’s well that ends well. It was definitely a fun and educative first-time experiment, as well as an exciting adventure for me. Such wonders to behold and marvel are blessings indeed! All praise and thanks to you, O God. Nevertheless, the best part of all this experimenting and learning was when I stumbled upon David Britton’s amazing site where he presented a life cycle photo journal of a Hyalophora cecropia moth in complete metamorphosis. 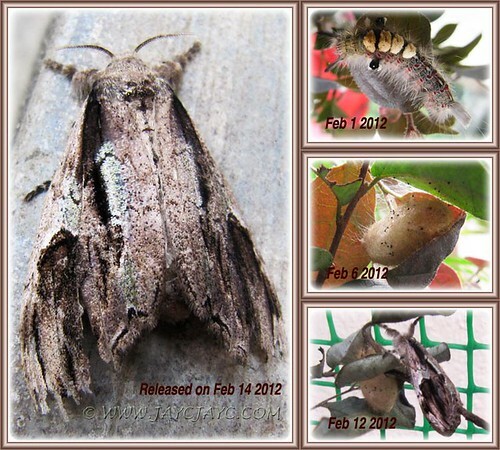 Simply awesome – showing transitions from egg > caterpillar growth > cocoon > adult moth, with spectacular photos and videos. Check here – something rarely seen and not to be missed!! 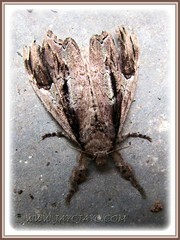 Description: The adult moth is dimorphic and very variable, Both sexes have different patterns of light and dark brown blotches, with random markings in white to grey too. The male has a wingspan of about 3 cm while the female, about 4 cm. Find out more descriptive details at The Moths of Borneo. Geographical range: Across Southeast Asia, including India, Indonesia, Taiwan, Thailand, Malaysia and Singapore, as well as New Guinea and Australia. Habitat: Higher abundance in cultivated areas. Food plants: A wide range of host plants that include Orchid trees (Bauhinia species), Ricinus communis (Castor Oil Plant), Gum trees, Fruit trees such as Durian, Guava, Jack-fruit, Lychee, Longan, etc. Isn’t that a wonderful process to witness! I now have my grandson watching for caterpillars and then he will tell the whole story to whoever want to listen (or doesn’t) I know that the butterflies I have “hatched” in my garden all seem to emerge just before sunrise, so you have to get up early to catch them. It definitely was, Gillian. Well, it’s never to late to learn and be amazed at such wonders, even at such a late age and I’m really thankful for the blessed opportunity.